Be that as it may, the two fanciers look back on 2018 with mixed feelings: an outbreak of the Newcastle Disease in the region suddenly put an end to their racing season, with the big classics just around the corner. Patick (68) and his son Dimitri Houfflijn (44) are a household name in pigeon racing. This successful combination has been one of the leading teams in Belgium for over 20 years now, mainly in the national long distance. This success story is founded on the old bloodlines of the late Robert Willequet and Roger Desmet-Matthijs. However, the team really stepped up their game with the introduction of the world class pigeons of Gaby Vandenabeele, the master from Dentergem. Two sons of his Blauwe Fideel (winner of a 1st Nat. Brive 1995), two daughters of Ronker (winner of a 1st Nat. Limoges 1995 and 1st Prov. Ace Pigeon Long Distance KBDB 1994), as well as a daughter of Turbo (1st Prov. 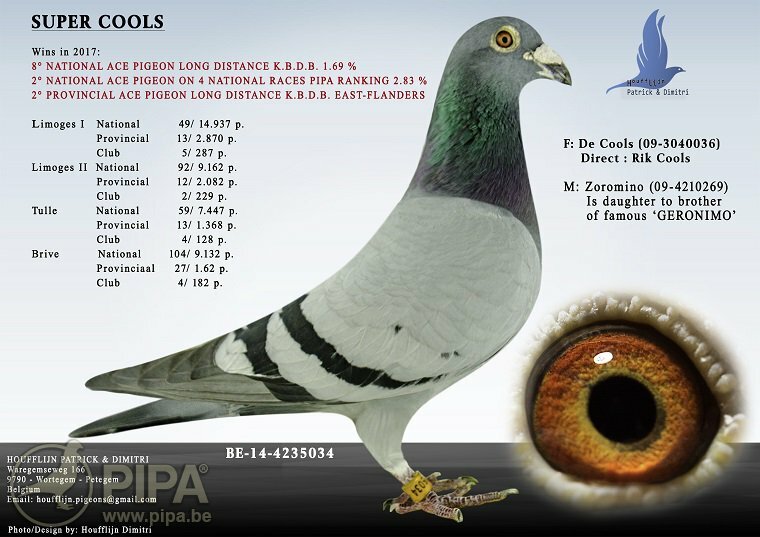 Ace Pigeon Long Distance KBDB West Flanders) were the starting point for a long series of top results, including a number of provincial first prizes and early arrivals at national level. Click here for an overview of the provincial and national champions from 2013-2018. A closer look at their current team of breeders reveals that more than three fourths of this breed consists of Gaby Vandenabeele descendants, combined with their old stock breeders and some recent introductions, some of which are also related to Vandenabeele: they obtained pigeons of fellow fanciers Roger Debusschere, van Rik Cools, Anthony Maes, Marc Pollin, and Bert Vandenberghe. 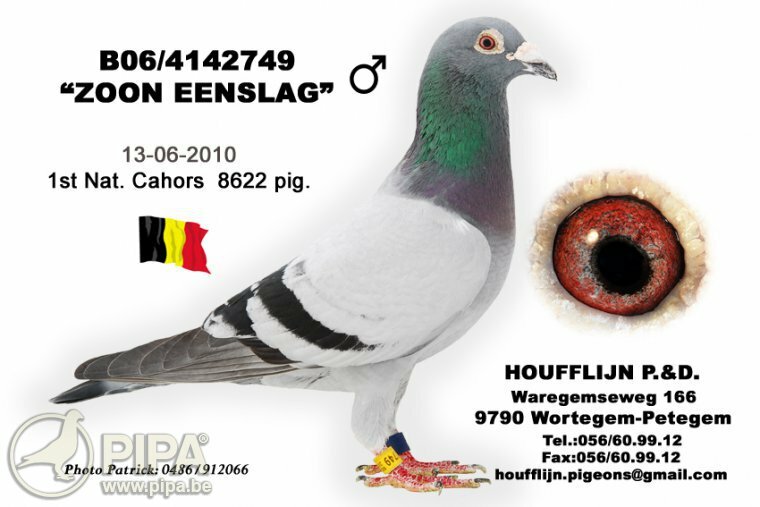 However, when you think of the Houfflijn pigeon breed, the name of stock breeder Geronimo will inevitably come to mind. He is without doubt the great star of this loft: he was a fantastic racing bird and he developed into a super class breeder later on. - He is the sire of Geschulpten Geronimo BE11-4196606 (see pedigree): winner of a 30th Nat. Brive 8,331 p., 37th Nat. Chateauroux 15,902 p., 32nd Nat. Zone Montluçon 7,828 p., 35th Nat. Zone Argenton 8,476 p., and 49th Prov. Vierzon 8,349 p. (click here for his full palmares). 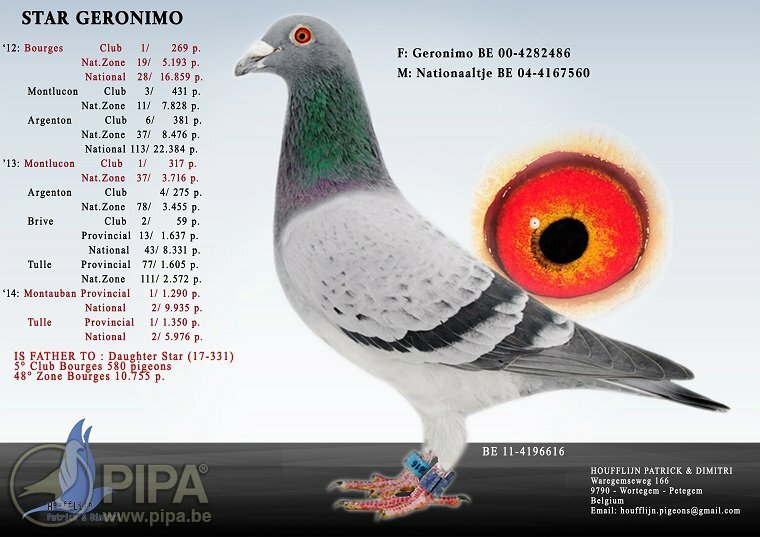 And there is much more: the Geronimo bloodline is now an integral part of the Houfflijn pigeon family. That same Geronimo bloodline has also given one of the big stars of 2017, namely Super Cools BE14-4235034 (see pedigree), winner of a 2nd Prov. and 8th Nat. Ace Pigeon Long Distance KBDB 2017 (click here for his palmare). He is a grandson of New Geronimo (full brother of Geronimo) from his mother's side, and his sire comes from some of the best Vandenabeele lines, through Rik Cools. 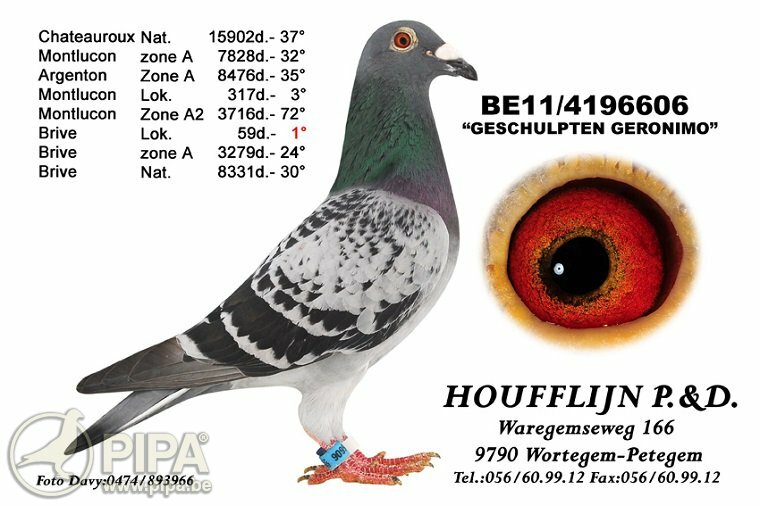 The list of achievements and the number of titles that they won makes it clear that the Houfflijn pigeons are a top of the line breed. This is one of Belgium's leading pigeon lofts! Patrick and his son Dimitri have been racing as a combination in Patrick's lofts in Wortegem-Petegem. Patrick races the pigeons and looks after them, while Dimitri is responsible for administration. A few years ago, Dimitri also started to race for the Houfflijn-Goemaere combination from his own loft in Anzegem, and this is a success story as well! This is a fairly small team with about 28 widowers and about 50 youngsters from the second round. They come from Patrick's collection. However, the idea is to build a second loft in the course of next year, so that this combination can compete in some additional races of the national (long distance) competition. 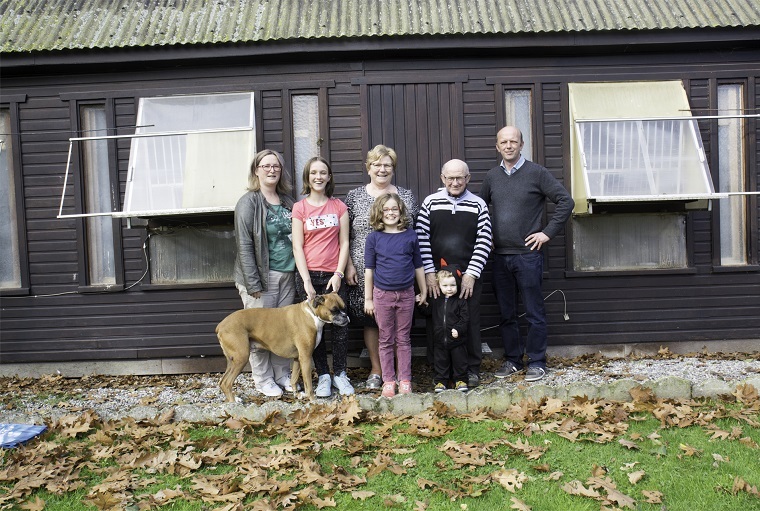 Both these lofts have had some fantastic results in recent years, claiming victories and early prizes even at national level, including several top 10 prizes in the national long distance. And the team was on the right track in 2018 as well, right until there was an outbreak of the Newcastle Disease in a nearby poultry farm. This was right when the most important long distance races were coming up, the races which the Houfflijn pigeons were particularly looking forward to. Since both Houfflijn pigeon lofts were within the 10km perimeter imposed by the government, both Patrick and Dimitri were unable to race for four weeks. In other words, due to this racing ban they could not compete in the long distance races from Jarnac, Libourne, Tulle and Angoulême. It put a sudden end to their old birds' season unfortunately. These races were supposed to be the highlight of the season but things turned out differently. It not only gives a false image of their 2018 season, they also had no chance of winning a championship or ace pigeon title this season. They simply were unable to defend their honour. However, the following list of achievements of 2018 shows that the Houfflijn pigeons were ready to excel in the high temperatures in July, both in the national long distance and the extreme long distance, just like they did in previous years. This team aims to excel from mid-June right until early August, with the last long distance race of the season. These are the most important weeks in the long distance, and the weeks in which the Houfflijn pigeons have been writing history in the long distance repeatedly. It turned them into national long distance champions in Belgium.